(“entanglement”), a common stew, roast or bread soup with liver and entrails depending on where it is prepared. In the Maragato region of León it is most commonly found in villages at the skirt of Teleno Mountain. It is thought to have originated as a meal for village warriors, of the Pre-Roman Period. Even today one feels the strength coming from the enormous cauldron in which it is cooked. Since ancient times chanfaina is part of the celebration of the slaughter of pigs. Too, it is an obligatory dish from time immemorial for mid-morning lunch on the feast days and at weddings. It contains the parts of the animal that must be consumed first after the slaughter, which can include lungs, guts, beef or veal trotters, ears, tripe, entrails, salt pork, bacon, lamb and blood. Pork liver, chunks of meat from under the pig’s chin mixed with fat and onion are added also in some areas and in others fried garlic onion, parsley, bay leaves and toasted bread. These are cooked slowly in an enormous cauldron with ingredients such as garlic, parsley, beet greens, lettuce, peppers or other greens like artichokes. Ares claims that it is a “entire barnyard” and vegetable garden in one pot. The Leonese brag that theirs is known for its abundance in quantity and quality. Their chanfaina must be served with wine from the Bierzo. Homemade bread also is essential to sop up the liquid and to wipe up the last bits at the bottom of the pan. Lamb or mutton chanfaina consists of lamb or mutton trotters, some entrails, lung and heads with lettuce or another green like artichokes and Swiss chard. Traditionally, this is served just after the lamb or mutton is slaughtered and on the eve of St. Martin’s Day for supper with rice. Pour the broth into a pot. Bring to a boil and boil gently for 10-15 minutes. Add the breadcrumbs. Continue to boil gently for 25-30 minutes, stirring from time to time. Chop onion. Heat a frying pan and add the olive oil. 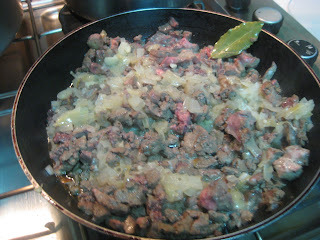 When hot add the onion and a bay leaf. When the onion begins to be translucent add the garlic. Chop the liver and lung into very small pieces. Add them to frying pan, turning from time to time until they change color. Do not cook anymore or the liver will become tasteless and hard like cork. Add pepper and oregano and mix well. Add the fried food to the broth and breadcrumbs and add oregano. Cover and simmer for about 30 minutes, mixing all with a wooden spoon. Add salt to taste. Continue cooking uncovered over very low heat, letting all the ingredients blend together and the sopes thickens. 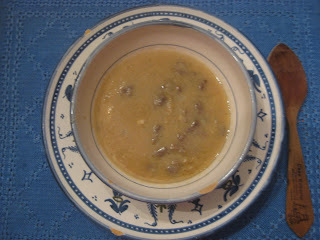 This is a simple recipe of chafaina commonly made by shepherds while watching their sheep. It was adapted by the Medieval Spanish Chef. Today, paprika is used instead. It is important to use a heavy pot to prevent the breadcrumbs from sticking to the bottom. Today chile peppers are also added.